To receive audition and performance notices, sign up on the NCFO mailing list by clicking HERE. This light-hearted galactic odyssey by NCFO Founder and Artistic Director David Bass is based on a familiar science fiction tale of heroes and villains, robots and aliens, unlikely adventures and supernatural nonsense. 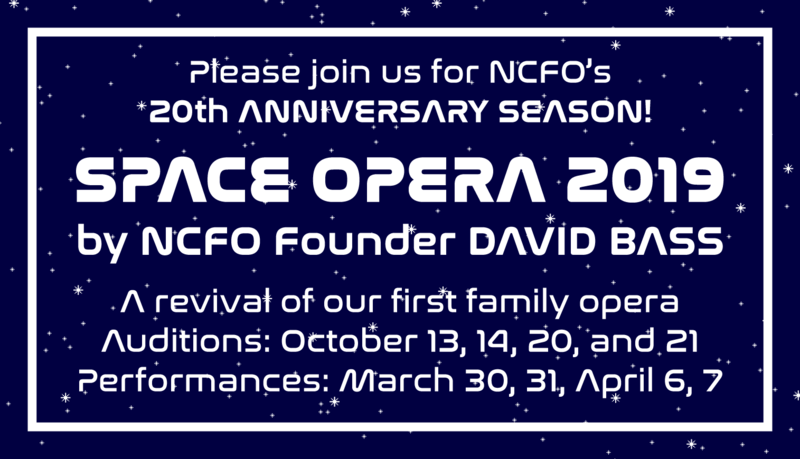 Space Opera is non-stop singing and non-stop action in two acts and features lyrical music in a variety of popular and classical styles that will appeal to audiences of all ages. Presented by an inter-generational cast in English with side titles. PERFORMERS: Everyone who wishes to perform needs to schedule an audition! The audition process includes the vocal evaluation as well as time to fill out forms, be photographed, and discuss schedules and volunteer job requirements. NON-PERFORMERS: If you would like to be involved in some capacity other than as a performer, we welcome people who would like to experience other aspects of our production. Opportunities are available in areas such as set construction, ushering, makeup and backstage! If interested, contact auditions19@familyopera.org or call 617-835-3162. FAMILIES OF PERFORMERS: PLEASE NOTE that every family must sign up for a volunteer job at the time of auditions. In order to be prepared to choose a job, please read through this entire web-page, especially the section entitled FAMILY PARTICIPATION AND WORK REQUIREMENTS below. Auditions will be scheduled at 15-20 minute intervals from 1:00 PM until 7:00 PM. The entire audition process (which includes filling out forms, photographing, and discussing the schedule and participants' responsibilities, as well as the vocal evaluation) usually takes about an hour and a half. Anyone currently 7 or older can participate, from children to adults, inexperienced to classically trained. There is no maximum age. We ENCOURAGE participation in our productions by multiple family members, both onstage and offstage. We may also ask that an adult perform or attend rehearsals with some children above these age limits. We require all participating families to sign up for a minimum of 8 hours of work on general tasks that support the production (set construction, painting, rehearsal cleanup, concession table, sewing costumes, etc.). Participants may sign up to manage a specific task for the production (time commitment varies). When you come to auditions, we will ask you to tell us what jobs you would be willing to do. You can download a description of all available jobs HERE. Please come with more than one job in mind. You can improve your chances of getting the job you want by discussing it with the auditions manager beforehand, when you schedule your audition. NCFO is a self-supporting non-profit organization. We do not charge a fee for participating in our production, nor do we charge admission to our performances. We gratefully accept voluntary, tax-deductible donations to help cover our production costs. Please consider donating to North Cambridge Family Opera, in any amount, if you enjoy being part of our production or attending our performances. Please bring information about your schedule (and/or your family's schedule) for November through early April, so that we can discuss potential conflicts. Also, please bring your checkbook, in case you would like to make a donation to the opera company at auditions, before it slips your mind. Come prepared to be photographed. Please note that we WILL be rehearsing on Martin Luther King Day weekend (Sunday, January 20), as well as the second Sunday of school vacation week (Sunday, February 24). The ENTIRE CAST rehearses on Sunday afternoons. The entire company rehearses from about 4:00 to 6:30. In addition, some members of the chorus are also in small ensembles, which rehearse between 2:30 and 4:00 (which of the several small ensembles that rehearse in this time window will vary from week to week). Major soloists may be scheduled to rehearse at any time between 12:30 and 6:30 every week, and minor soloists will also be called to rehearse early at one or two rehearsals. We always end all rehearsals on time at 6:30. We try to plan and publish a rehearsal schedule for each month, but things change from week to week. We send emails with the final schedule, usually the Friday before each Sunday rehearsal. On very rare occasions, we may require major and some minor soloists to rehearse on a weekday evening or two as well, but we're not expecting the need for this to arise. ALL CAST MEMBERS must attend scheduled runthrough rehearsals (tentatively scheduled for Saturday, March 16 and Sunday, March 17, 2019) and dress rehearsals (Saturday, March 23 and Sunday, March 24, 2019); therefore it is important to check your family's schedule before accepting a role in this show. You will be scheduled for two 4-hour runthroughs (one on Saturday and one on Sunday) and two 4-hour dress rehearsals (one on Saturday and one on Sunday) on these very important weekends. These are the rehearsals where everything comes together and many things get changed, so it is critical to be there! Tentatively, two performances a day are scheduled for March 30 and 31 and for April 6 and 7, with each cast member scheduled for four of these eight performances (ordinarily one per day). However, this schedule may be modified pending availability of the venue and number of participants. This opera will run about 120 minutes in performance, plus a 20-minute intermission. Ordinarily, all family members who want to perform in our show audition at the same time. We will make an audio recording of a portion of your audition to help us with casting. If you are auditioning for a lead role, we will make a video recording of your prepared solo (see below) so that we can evaluate both your singing and your acting abilities. You don't have to decide which role to sing for: how we cast you will not depend on which song you sing, so just choose the song(s) that fit well in your range. Please do NOT ask the director what role you or your child should try out for, as it really doesn't matter. If you are not auditioning for a lead role but are interested in a small, elite chorus, you should learn a short passage (see below) to demonstrate your skill at singing harmony. Even if you are not interested in a close harmony ensemble, it would be helpful for my casting efforts if you could learn and sing this passage to show me your abilitiy to sing harmony, but it is not required. If you do not want a lead solo or to be in a close harmony ensemble, you don't need to prepare anything to sing. We put a great deal of thought into casting the opera. We double cast each role, so each soloist sings in four of the eight performances. We often are able to give everyone who wants one a solo, although we cannot guarantee it. There is always a lot of singing to do in the chorus and in smaller ensembles, though. Because our shows are double cast, we must divide participants into two casts before final role assignments can be made. It may be a month or two before you find out your solo assignment, so please be patient. We endeavor to assign solos that will challenge you but not overwhelm you. We consider not only ability to sing, act and dance the role, but also age, number of years participating in the opera, and roles sung in previous NCFO operas. We will not assign you a solo role that requires you to sing harmony (see the table below) unless you have demonstrated the ability to do so in audition (to do otherwise would not be fair to the other ensemble members). If you want to be considered for one of the larger solo roles: you MUST prepare using the sheet music and MP3s provided below. You can audition with the music for any voice part. You will be asked to sing two songs, a solo with just the accompaniment and an ensemble piece with other voices singing as well. It is therefore important that you practice with both the provided MP3s that will be played at your audition. If you are not interested in one of the larger roles, but would like to be considered for a close harmony ensemble, or if you would just like to have fun demonstrating your harmony skills (which I appreciate, helps me with casting), you may sing "Oh Dear 2" (under "Materials for Harmony Auditions" below). All other auditions require no preparation. intentions are upset by forces beyond his control. NOTE: If "The Battle II" is a little high for you, you can sing "Jabba Jive" down an octave instead. See music for Mezzo Sopranos, High Altos above. Principal solo roles are listed below. All ranges span at least one but no more than two octaves. Voice parts and ranges are moving targets. Notes can be changed and passages transposed as required. As indicated, many suggested voice parts can optionally be sung up or down an octave. In addition, there are 35 supporting solos. There should be plenty of solo opportunities for everyone.